From judging food festivals to interviewing food makers to working with cool chefs, and experiencing new food and restaurant openings I love the world of food that I’ve been exploring. 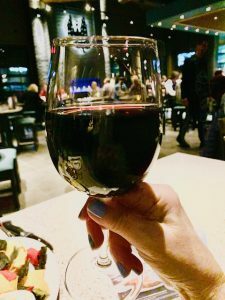 So when I was invited to a special media/food blogger VIP tasting at the Peachtree Corners‘ opening of Firebirds Wood Fired Grill I should have been over the top excited to attend. However, it was a rainy, raw night and in all honesty I was tempted not to go but I had promised my friend Lesley Gamwell, Rountree Group – the agency that coordinated the event. So off I went. And let me tell you – I am so glad I did! Note: Never under estimate the power of relationships! Thank you Firebirds Wood Fired Grill for invitation. The meal was complementary except for the wine. No other compensation was received. All opinions in this post are those of the author. 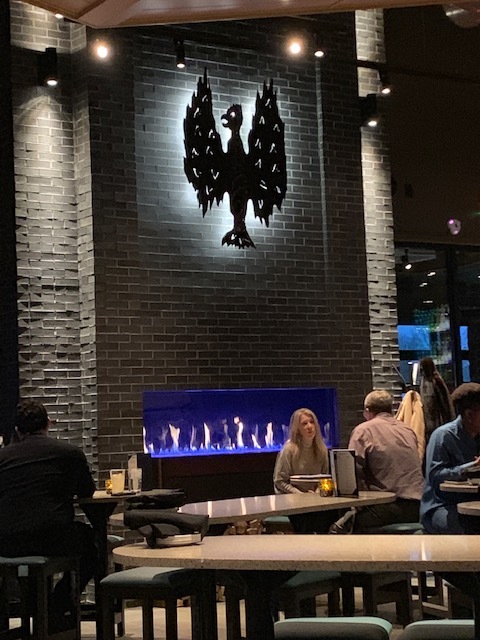 Walking into the Firebirds Wood Fired Grill I first saw a huge, beautiful fireplace. It was perfect to chase away the night’s chill. Looking over the menu I found it to be diverse including sea food, steaks, sweets and more. It was the fire grilled steaks I was focused on tasting. “It’s all about the wood. 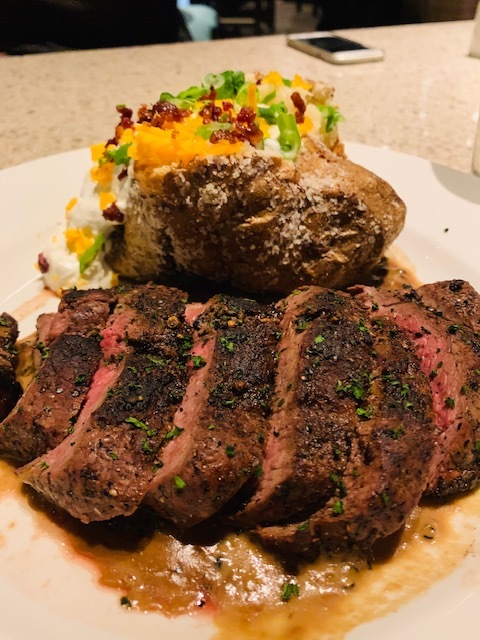 We use hickory and oak so the food is perfectly charred and that gives our dishes that extra flavor we are known for.” Chef Donte Youmans, Firebirds Wood Fired Grill. 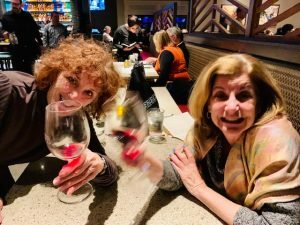 My lucky friend Bobbi joined me in this adventure – benefits of knowing a food blogger 😉 Although the adult beverages offered included several creative cocktails, we chose instead to enjoy a glass of red wine with dinner. We were given a taste of the wine before we ordered. Nice touch that I wish more restaurants would put into play. The house wine, Giruard, was lovely and at a good price point. While we waited for our steaks, we munched on a couple of Shareable appetizers. 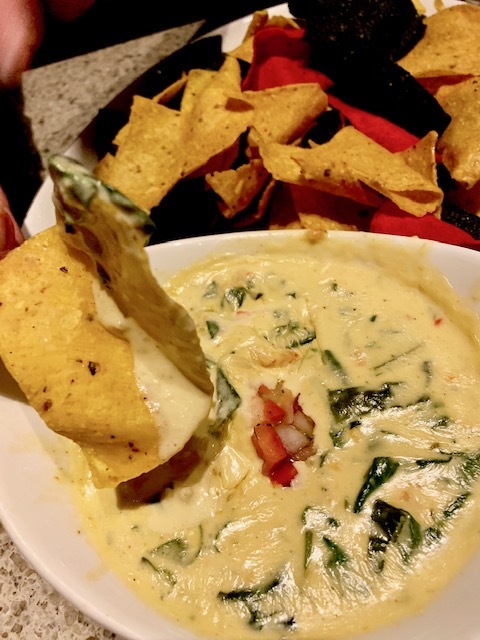 Lobster Spinach Queso – So Good! Then the steaks were served or should I say, our server Makalyia “presented” them to us! 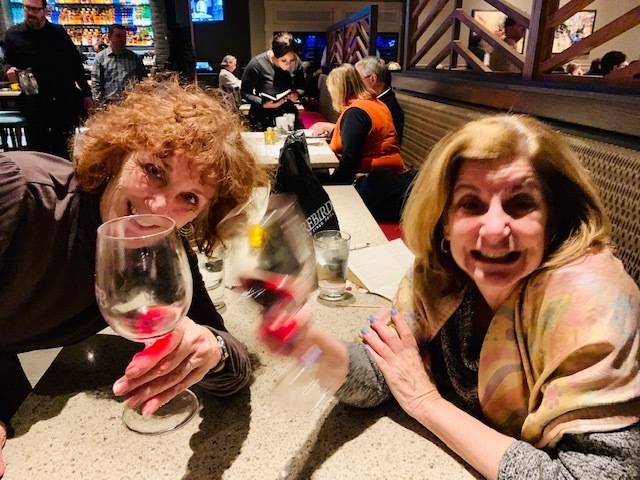 Good that Bobbi and I are friends because I had the opportunity to taste two very differently prepared steaks: Pepper Encrusted Sirloin(Center-cut, sliced wood grilled sirloin, au poivre sauce) and the Aged Ribeye. The pepper gave the sirloin a nice crust and great flavor. The Ribeye was melt in your mouth perfect. We included a loaded baked potato and Parmesan mashed potatoes to round out our meal. Needless to say we enjoyed every bite! As we were sipping the last of our wine, Makalyia asked if we had room for dessert. Bobbi and I looked at each other, grinned and nodded. 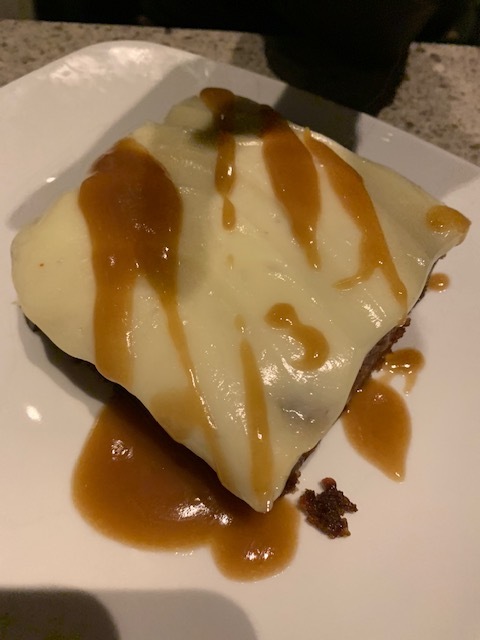 The Creme Brulle Cheesecake immediately caught our attention and Makalyia’s suggestion of Carrot Cake with salted caramel sauce served warm won us over. I must admit I expected the Creme Brulle Cheesecake to be more of a traditional creme brule perhaps with a chessecake type custard; so I was surprised when the dessert that arrived was a chessecake with a creme brule topping. Sometimes the unexpected is a delicious surprise! 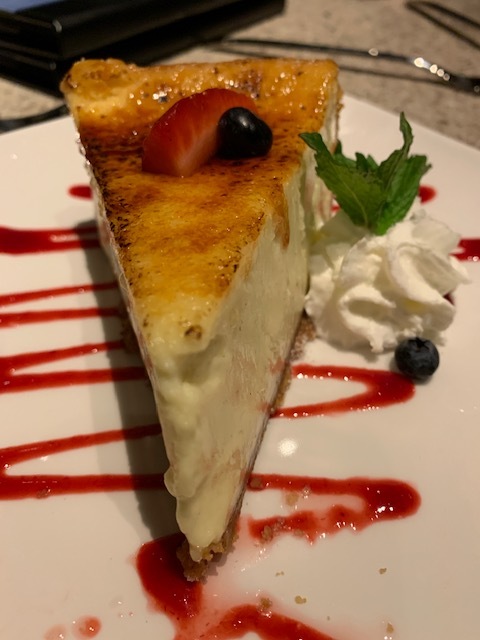 Creme Brule Cheesecake from Firebirds Wood Fired Grill ~ OMG! Drinking the last of our coffee, which was excellent by the way, Bobbi and I both agreed it was worth venturing out to Firebirds Wood Fired Grill on a rainy night! restaurant. 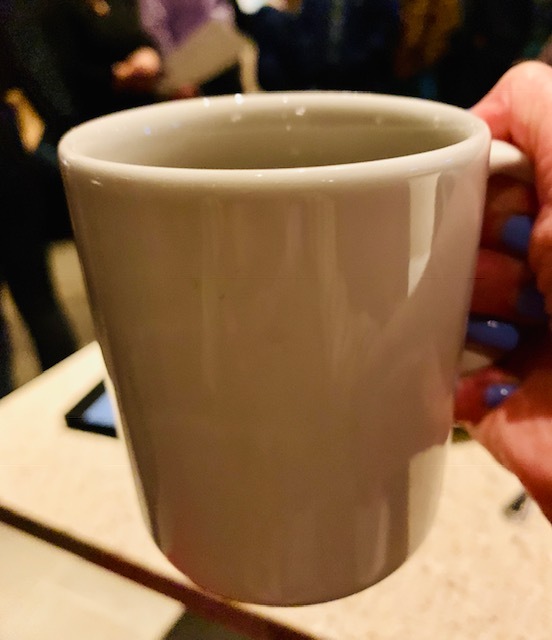 It seems my God-daughter and her boyfriend were looking for a special restaurant for their first ‘real date.’ Guess where the young couple celebrated this special occasion? 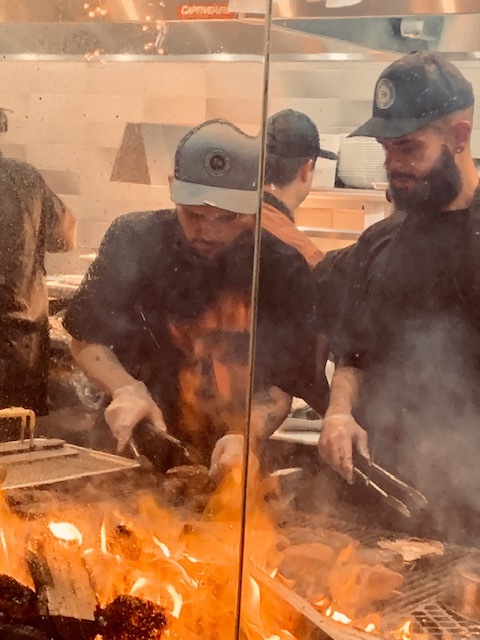 To build a successful restaurant business takes many people who are committed to the concept, who are passionate about what they contribute and who understand that team work is a critical element. Not surprisingly an important member of the team is ~ The Chef. 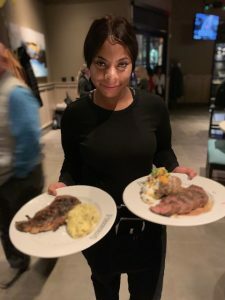 I want to go behind the pots and pans and introduce you to the special man, Chef Donte Youmans, who is the chef at the Peachtree Corners’ Firebirds Wood Fired Grill. Chef Donte kindly tells us his story from why and how he developed his passion for food to what is like it is like to lead the culinary staff at the Firebirds Wood Fired Grill’s 49th restaurant. I am 35-years-old, married, and I have a daughter who is 15, and a son who is 8. I was born in the Bronx, and lived in Texas for nine years before heading to the Southeast. My family and I are very happy to be in Georgia. 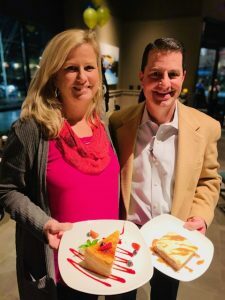 Diva Foodies: Your title is listed on the Firebirds Wood Fired Grill Peachtree Corners website as “Chef.” What does being a chef at the newest Firebirds’ restaurant, number 49 (! ), mean to you? Chef Donte Youmans, Firebirds Wood Fired Grill: It means a lot to be the Chef at a brand new Firebirds location. I enjoy being a part of something that is built from the ground up, and this gives me an opportunity to create dishes for a whole new group of guests. 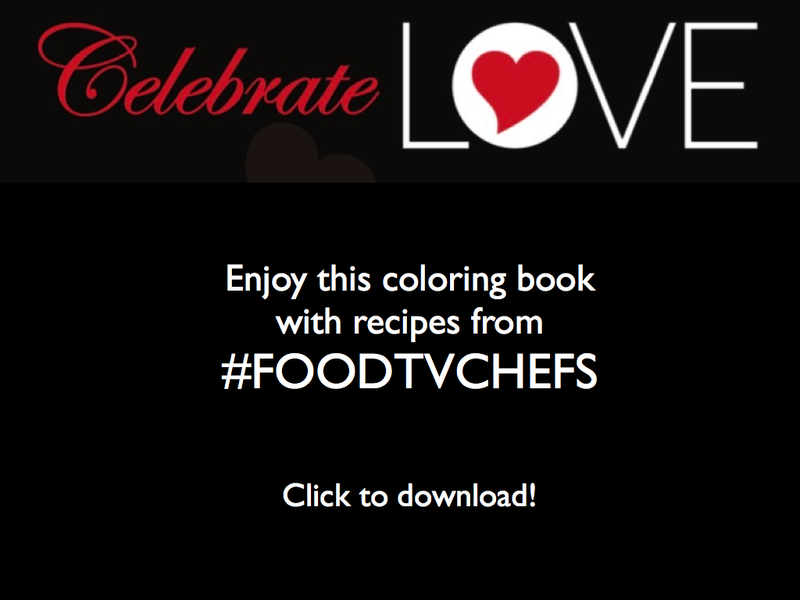 Diva Foodies: There are so many ways that a “chef” can earn a living from catering to personal chef. Why did you decide to become a restaurant chef (not necessarily at Firebirds but in general)? Chef Donte Youmans, Firebirds Wood Fired Grill: Cooking has been my passion since I was 6-years-old. I first fell in love with food when I was in the kitchen with my Mom and Grandmother – that is where we as a family really bonded. Chef Donte Youmans, Firebirds Wood Fired Grill: The staff loves the Exhibition Kitchen. They are proud to display their talent and our guests enjoy watching them at work! Diva Foodies: The restaurant is famous for its wood grilled foods. For those who are not lucky to have a Firebirds Wood Fired Grill in their area and/or who love to grill at home, what tips can you give to the home cook about wood grilling? 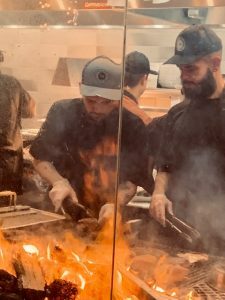 Chef Donte Youmans, Firebirds Wood Fired Grill: It’s all about the wood. We use hickory and oak so the food is perfectly charred and that gives our dishes that extra flavor we are known for. 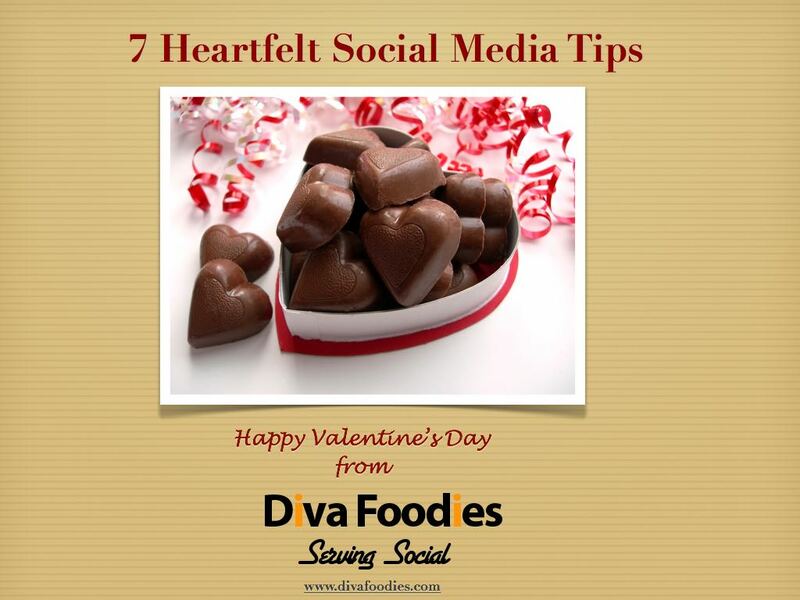 Diva Foodies: Another special aspect to how food is prepared is that much of the food is locally sourced. 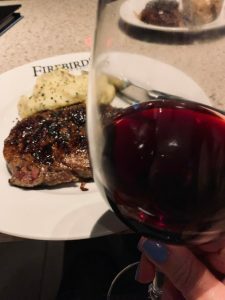 We love that Firebirds Wood Fired Grill supports local. How do you find your local vendors? We have established great partnerships with local sources which benefits our Alpharetta and Peachtree Corners locations. Our firewood is locally sourced as well. Diva Foodies: I very much enjoyed my divalicious meal at the Peachtree Corners, GA location. What are a few of your favorite Firebirds Wood Fired Grill dishes? And Why? 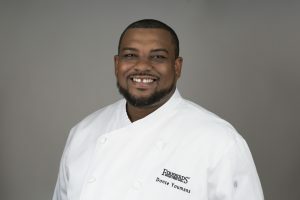 Chef Donte Youmans, Firebirds Wood Fired Grill: My favorite bar bites are the lobster spinach queso – it’s filled with tender pieces of lobster, and our smoked wings – they are‘fall off the bone’ good. I have to say my all-time favorite entrée is the Chile-rubbed Delmonico steak. We blend sugars and spices which are then caramelized over the grill to give it a balance of sweet and smoky divaliciousness. Diva Foodies: We loved the lobster spinach queso too! 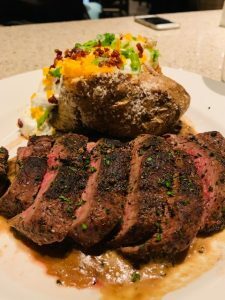 The Delmonico steak sounds incredible ~ on our next visit to taste list! As is Diva Foodies tradition, I’ll toss this back to you to wrap anyway you like. 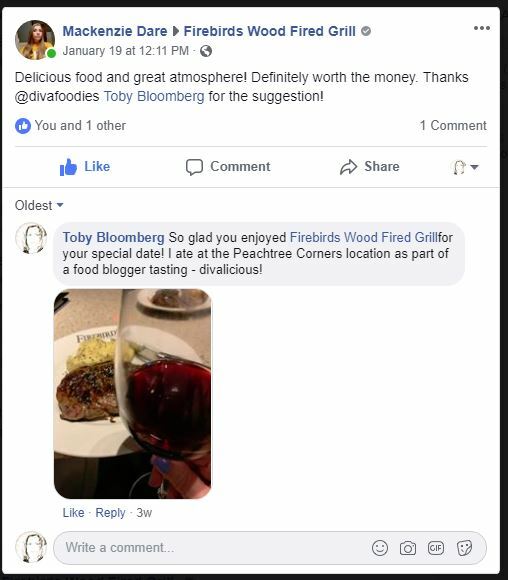 Chef Donte Youmans, Firebirds Wood Fired Grill As one of Atlanta’s leading food bloggers, we are so glad you loved your dining experience at Firebirds Wood Fired Grill and we look forward to hosting you again soon in Alpharetta or Peachtree Corners! Thank you, Toby! Connect With Firebirds Wood Fired Grill! So glad you enjoyed Firebirds – it’s one of the best steaks I have ever had and that includes Stoney River, Ruth’s Chris. Thanks for your comment Lesley. Agree. Firebirds is a divialicious steakhouse with a warm inviting vibe… and it’s surprisingly affordable – even for a young couple on a special date!